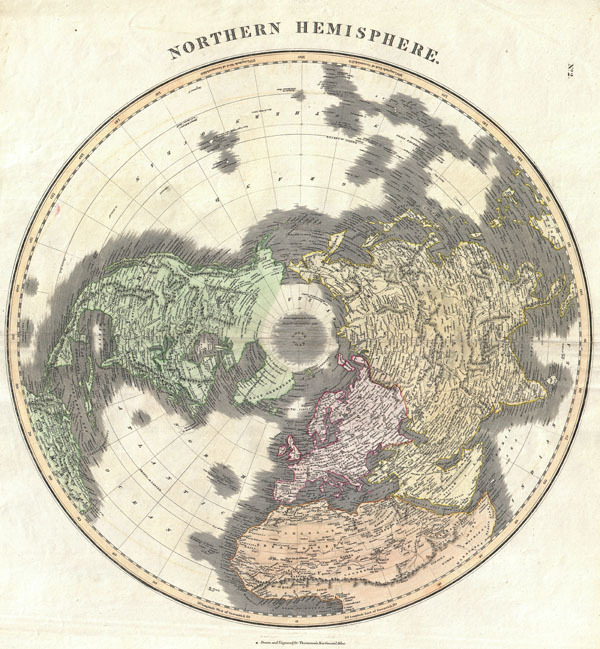 This fascinating hand colored 1814 map by Edinburgh cartographer John Thomson depicts the Northern Hemisphere from the Arctic to the Equator. Includes all of North America, Europe, and Asia as well as the northern part of Africa and South America. Impressive detail encompasses both political and geographic features. In Africa the mythical Mountains of Kong are shown extending eastward to join with the Mountains of the Moon – mythical source of the Nile River. Exhibits a general lack of information regarding the Arctic and connects Greenland with the mainland. Seems to leave the possibility of a Northeast, though not a Northwest, passage open. Engraved by Kirkwood and published by Baldwin and Cradock as plat no. 2 in Thomson's Atlas.